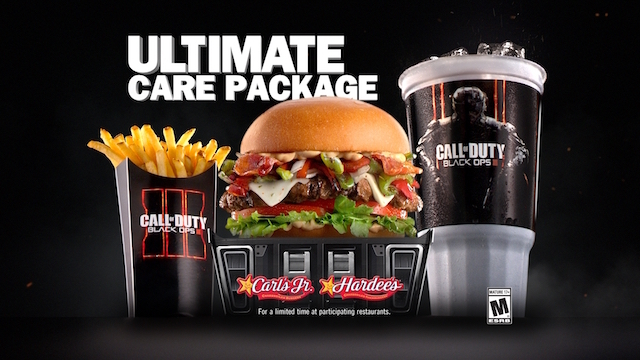 Fast food chains Carl’s Jr and Hardee’s today announced a new partnership with Activision for Call of Duty: Black Ops 3. The new partnership will bring Black Ops 3 branded packaging to the Ultimate Care Package meal at these restaurants, which will include a Tex Mex Bacon Thickburger, large fries and a large drink. In addition, with each purchase, players will have the opportunity to win a Treyarch VIP Experience. A three-day, two-night trip to Los Angeles that includes a tour of award-winning Call of Duty design studio, Treyarch, and the chance to meet members of the Call of Duty: Black Ops III development team. The Grand Prize Winner will also receive a gift bag full of Call of Duty: Black Ops III gear, including a copy of the game signed by members of the studio. But that’s not all: this new tie-in will also include the chance for fans who purchase the Ultimate Care Package meal to get an in-game personalization pack for Call of Duty: Black Ops 3, the game itself, and even the Astro branded Black Ops 3 mod kit. Instant-win prizes include: Call of Duty: Black Ops III games, Astro headsets outfitted with a Call of Duty: Black Ops III mod kit, in-game themed “Take Out” personalization pack containing a weapon camo, reticles and a calling card, as well as other clothing and gear items from 5.11 Tactical, and free food coupons. In addition to the in-restaurant activation, this program will feature in-game items when Black Ops III launches worldwide on November 6, 2015. Select sweepstakes winners will receive in-game items, including the “Take Out” personalization pack that features a specialized weapon camo decked out with a ketchup, mustard, and extra pickles themed design. They’ve also announced a partnership with the Call of Duty Endowment, Activision’s non-profit organization that helps veterans find jobs; on Veteran’s Day – November 11, 2015 – all proceeds from fans purchasing the Ultimate Care Package meal will go to the Call of Duty Endowment. Even more, Activision has teamed up with Carl Jr’s and Hardee’s to launch an all new ad campaign called ‘Best Day Ever’ featuring Charlotte McKinney. The ad will premiere in the US starting October 26th. To support this partnership, Activision and Carl’s Jr. and Hardee’s restaurants collaborated on a new ad campaign, titled “Best Day Ever,” featuring the return of Charlotte McKinney.McKinney’s “Au Natural” ad debut in early 2015 garnered over 4.5 billion media impressions and more than 12 million views on the chains’ YouTube channel. This time, viewers will see her like never before – armed and ready for battle. McKinney saves the day in the middle of a pyrotechnic-filled trailer inspired from the world of Call of Duty: Black Ops III. McKinney even performed her own stunts in the commercial. The ad will premiere nationally on October 26. You can find official rules and information at www.carlsjr.com/callofduty or www.hardees.com/callofduty.